In other words, this isn’t a Regular Buy, but it’s not a short-run Special Buy (ALDI Find) either. Instead, this product seems to run for at least a couple of months during the winter holidays … but probably not long after. Gone are the days when everyone made homemade pie crusts. Now, it’s easier to buy ready-made pie crusts at the store, and they taste just as good as the homemade variety, with much less work. The box front states your pie bakes in just 9-13 minutes, but that depends on your recipe. If you’re making a basic fruit pie with pre-cooked fruit, your bake time may be that short. However, I made a quiche recently with one of these crusts that baked for 60 minutes, with foil around the crust edges to keep them from over baking. My daughter and I made a pumpkin pie for Thanksgiving with the other crust in our box, and that baked for about an hour. The box advertises that it contains recipes inside as well. If you open and unfold the box, four pie recipes are printed on the inside, including the same pumpkin pie recipe I got from the can of pumpkin I purchased at Aldi to make pumpkin pie for Thanksgiving. The other recipes are for a chocolate pudding pie (made with vanilla ice cream), a lemon chiffon pie (made with lemonade drink mix), and a French apple pie. The pie crusts can be kept frozen or refrigerated. For best results, use before the date on the box. My crusts I bought the week before Thanksgiving had a best before date of December 11 of the same year, so these crusts are good in the fridge for only a few weeks. Aldi’s Bake House Creations Pie Crusts taste as good as homemade crusts and are worth using in your next pie-baking venture. They can be stored in the fridge for a few weeks or frozen, and the box comes with several recipes. Recommended. 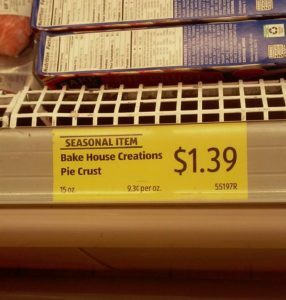 Where can I purchase the bakehouse crust that Aldi discontinued? As pie bakers we absolutely loved it! It was two unrolled crust in a box. I checked last week with a manager and she said it is now a seasonal item. What?! People make and eat pie year round. I’m a little put off by that. There is so much gluten free and organic stuff now. Wish they would remember regular eaters shop there too! Hi Rose, I remember a few years ago asking an Aldi’s emplyee why they didn’t carry more organic labels. Her response made me shake my head when she told me that the store really is meant to appeal to the pocketbook and while they would carry ‘some’ organics the bulk of their products would remain non-organic. I guess the worm has turned because somebody ‘told’ me that Aldi’s is going completely organic. I agree about the pie crusts. I just took my last package out of the fridge to bake a quiche. My interest is actually how the flour is processed and there’s no label that will tell me that. Today factory farms actually kill the ripe wheat with herbicides like glyphosphate. It’s left in the fields to dry and die for a couple of days and then harvested and processed into flour etc. Seems that it’s more cost effective to harvest dead wheat than living wheat. Go figger. I mostly buy my flours from King Arthur Flour (I bake bread) and realize after reading this post that I really need to find a pie dough recipe that will turn out to be pie dough. Not my forte. In our world today, grocery shopping has become a marathon of label reading as well as trial and error. Good luck to you AND me. Mix flour, salt and Crisco in bowl using pastry blender, work until crumbly.Add just enough cold water so the dough sticks together,mixing with a fork. Split the dough in half.Form each half into a ball. Lay out pastry cloth and sprinkle with flour.On the pastry cloth, rollout one ball of dough a little larger than the pie pan and place on the pie pan .Repeat with the second ball of dough. I have used aldis bakehouse pie crusts since we finally go a store in Harrison Ar, they are better than my homemade crusts and I have made pie crusts for years. Where can I find these crusts? I love baking pies. These crusts are the best!! I went to Aldi’s this morning only to find they do not have the Belmont pie crusts anymore. I would have loved to use them to make my blueberry pies but guess I have to go elsewhere. I talked to someone else there and they said they are asked for on a daily basis. I wish they would ge them back in since Aldi is my go to store. I went to my neighborhood Aldi store and I didn’t see the ready made pie crust. These were very good, easy to use andconvenient. I wish Aldi would bring them back, especially for the holidays: Easter, Thanksgiving and Christmas. Used to buy them regularly for chicken pot pies. Was told at our local aldi in VA that they are now only a seasonal item. Just spent almost $7 for two at a “real” grocery store next door. Hate it when aldi doesn’t have something I need, I always feel like I got ripped off when I shop anywhere else. Hopefully the Lidl that opens here soon will have all our staples! I’ve been told they are a seasonal item (weird!) and will be back in October. Fingers crossed! I don’t get the whole ‘seasonal item’ nonsense on kitchen staples such as pie crust. I think Aldi needs to stop focusing on baby/pet/camping/whatever stuff and go back to their roots… groceries. We’re also starting to have issues here in Maryland where advertised products never arrive in the store. I agree! Also all the gluten free and organic everything. Just real food appeals to more people, I’d be willing to bet! lard instead of a vegetable shortening. Very sad!!! And disappointing. I bought 10 boxes today at my local Aldi in Ohio. The freeze wonderfully for months in fact. I may buy a few more next week. Just bought these last week at my Aldi (mid-November 2017). $1.89 per box. Made mini apple pies and the crust was delicious, browned perfectly, and great thickness. My husband buys these pie crusts by the box. He’s really disappointed that the manager told him they were a seasonal item.People make pies all year long. We do farmers markets and make pies. Your crusts are the very best. Please bring them back. Don’t make them seasonal. These are the best. What is this ‘ seasonal ‘ nonsense. We bake pies all year round…,come on Aldies. Get back. To the business you are In…we. heard you’re going to try to rise to the top in America….well, bring that delicious, homemade. Pie crust , and come on…..rise. These are the best. What is this ‘ seasonal ‘ nonsense. We bake pies all year round…,come on Aldies. Get back. To the business you are In…we. heard you’re going to try to rise to the top in America….well, bring that delicious, homemade. Pie crust , and come on…..rise. No, I have never commented on this site. Tried to….wouldn’t. Go. Why don’t they make this a staple item? I also want them permanently on the rack just like canned biscuits. Hard hard caN that be?.. On the other hand, Marie Callendar Frozen Pie crusts are to die for. If you can find them.